american football | You Can Do More! Something struck me recently after observing the fans in action live, during a college game, and then watching the TV coverage during a professional game. When did the concept of being a “good” fan or a “super” fan change? When did the definition of a fan change from “one who goes to the game, cheers for their team, and focuses their attention on the athletes competing”, to “one who goes to the game and tries to draw attention to themselves”? The amount of inane antics and silly costumes worn by “superfans” is ridiculous. It really has become all about “hey, look at me” and very little about the competition or the competitors. Just Google the term “superfan” and see what you get. Give me the loyal fans who know the athletes names and positions, are intent on being entertained by the action on the field, know when to cheer (or boo) and are doing so to help further the cause of the competitors doing battle… for their team… for their city… or school. 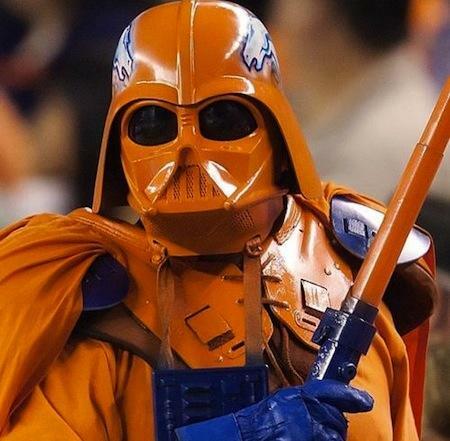 I don’t need or want to be entertained by someone dressed up in a Darth Vader costume with their team’s logo on it…. and I don’t buy the concept that by doing so, they somehow “care” more. I really don’t want to be distracted from the game that I love. I love watching the athletes compete. I love watching the strategy of the coaches unfold. I love the great plays… the great hits… the great catches… the great runs. For me, that is entertainment enough.